ITV has apologised to its HD channel viewers after a "transmission problem" caused them to miss England's first World Cup goal. 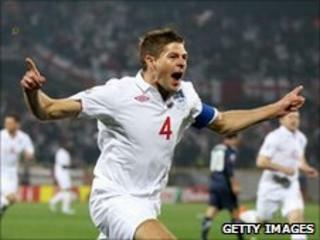 Viewers did not see Steven Gerrard's early strike against the USA in the 1-1 match. Some reported seeing an advert. ITV said coverage had encountered an "interruption" and presenter Adrian Chiles apologised on air at half-time. Last year, ITV viewers missed the winning goal in a Liverpool-Everton FA Cup tie when coverage cut to an advert. One viewer writing in the ITV.com forum said: "I'm watching the game on Freesat HD and ITV cut to adverts just before England scored the first goal." Another wrote: "That was a disgrace, I miss the first England goal of the World Cup as ITV cut us to an advert break on ITV1 HD!!!" Those watching ITV1 were unaffected by the error. The match was seen by an average audience of 13.2m, which equated to 56% of the total number of people watching television at that time. An ITV spokeswoman said: "A transmission problem temporarily affected ITV1's HD service during the England/USA match. "ITV standard definition service continued uninterrupted. We apologise for the interruption in transmission." Last year's FA Cup glitch led to 1,000 complaints. ITV boss at that time, Michael Grade, described it as "inexcusable".